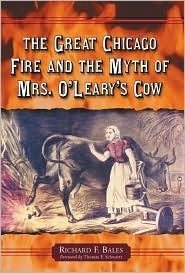 While this is undoubtedly a valuable book that finally clears the name of Mrs. O'Leary, points out the correct culprit behind the fire, and lines up other contextual factors (anti-Irish, sexist, classist factors, etc. ), it sure is a boring read. Not surprising since the author is an insurance adjuster. This makes him very suitable for examining the evidence of the fire, but he should have found an actual writer to help him out with his prose. This should have been titled Debunking The Mrs. O'Leary Myth Ad Nauseum.